14ymedio, Zunilda Mata, Havana, 23 November 2018 — Without long lines outside stores or massive orders via Amazon or store windows decorated for the occasion, we have Black Friday in Cuba, a practice that has come with the private sector and that this year has featured extensive offerings in the informal market. 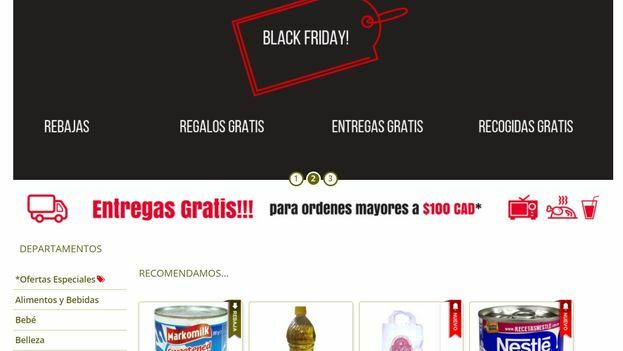 “If you send text message with the #BlackFriday hashtag, we discount 20%,” says an ad spread across several websites offering purchases and shipments to Cuba. Benefitting from the sales are both Cuban emigrants who send products to family and friends in Cuba, as well as self-employed entrepreneurs who order the merchandise to sell on the Island. The offers are included range from dishes, through mobile phones to food supplements. Originating in the United States, “Black Friday” marks the start of the Christmas shopping season and is characterized by its significant reductions in prices. Custom now dictates that Cyber Monday is celebrated on the following Monday. Its original intention was to boost digital sales that had once taken place on “Black Friday” in physical stores, but today these borders do not exist and “Cyber Monday” focuses on selling technological products at tempting prices both on-line and in street-front stores. As a practical matter, Cubans living on the island cannot make online purchases because very few have a credit card. For this they depend on emigrants, and thanks to them and to the sites that ship to Cuba they can take advantage of these offers. “Sales and gifts, free delivery,” read an email sent to thousands of people and intended for Cuban emigrants. The discounts were only valid until 23:59 on Friday. Nobody is surprised by these options because, little by little, certain festivities and traditions that come directly from Cuban emigrants in the United States have entered the island reality. “We are taking advantage of the two-day opportunity because Thursday is Thanksgiving and Friday is Black Friday,” explains Duaney, a merchant who specializes in footwear and appliances. Although the state stores, the only ones that legally exist in the country, did not show a single sign that this Friday was commercially special, the private sellers filled that absence. “Two for the price of one,” “spend your black Friday here, so you do not miss the sales,” “it’s not Monday and it’s not Tuesday … it’s Black Friday,” were some of the improvised slogans of a sector of sales that officialdom limits. Since the authorities banned self-employed workers from selling imported merchandise at the end of 2013, the inspectors persecute those who market these goods. But instead of disappearing, merchants have retreated to the black market and now widely use classified sites to place their products. A mobile phone number placed in an advertisement is the primary link to contact the sellers. Instead of an automatic recording, José Luis, 38, repeats in his own voice the Black Friday sales every time an interested party calls. “If you want an appliance, the rebates are up to 15% this Friday and if you are looking for clothes, shoes or perfume we have discounts up to 35%,” he says on the phone to everyone who calls. Others reject the arrival of these commercially focused dates of foreign influence. “We have reached a point where Halloween is celebrated more than Mother’s Day and where Cubans in Miami dictate to the family here that they should eat turkey instead of pork,” a retiree complained on Thursday, as he stood in line at a Western Union office on 3rd street in Havana’s Miramar district. Most of those waiting to collect their remittances sent by relatives from the United States had a plan to celebrate Thanksgiving, more to please their families across the Straits of Florida than becuase of their own desires. Some also thought to set aside some of the money to spend on Black Friday. Black Friday has also coincided with the days dedicated to second anniversary remembrances of the late leader Fidel Castro, a bitter enemy of consumption. “With him in the Government, none of this would have been possible,” speculates José Luis, the seller. While in state markets posters with the face of the Commander in Chief are seen, the young merchant’s small illegal shop offers brands such as Adidas, Nike, Huawei and Dolce & Gabbana.